On Thursday, January 17, there was a Village meeting to present the proposed development plan for the north side of the causeway. The key part was the unveiling of the concept drawings of the Boardwalk, a walking structure designed to be built over the water. 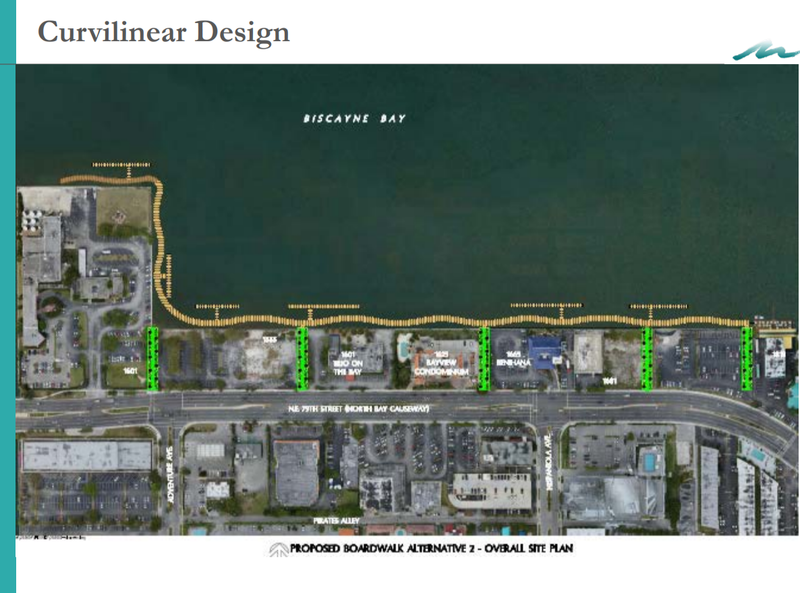 This is different than the "Baywalk" which is the section of waterfront that is on solid ground and is part of the widely ignored public easement requirements for any new waterfront projects in North Bay Village. You can see a detailed rendering here. Clearly, it's a great concept and what we've been waiting for since what? 2008? I love the curved design which serves the dual purpose of preserving the needed sunlight for the seagrasses and the coral rocks being put in to help the shoreline, while creating an interesting walking space with different views. I'm a little less crazy about the height variances since these could be obstacles for people with mobility impairments and don't really match the Florida flat landscape of the islands but that might work out well. It was a bit hard for me to envision. The Boardwalk will be open to the public through walkways to be constructed between the new buildings. The design company, Coastal Systems, has experience in this type of project and seems very confident that it can executed. Financing: Coastal Systems is working with a very ballpark estimate of $4 million, the bulk of which should come from impact fees from the new buildings and grants. I am skeptical of that number. Paul Vogel Park cost $4 million and it's crappy. The cost for digging out the small strip of land between the Grandview and the Causeway is apparently nearing $1 million to prep for a park under the bridge that will not and should never be built. God and Kimley-Horn only know what the sewer "project" is going to finally cost but it is certainly going to be notably more than we planned. Still, it's a good project and it's good to see forward motion on the development. But the Boardwalk alone is not enough. There has been a lot of talk about the new Unified Land Development Ordinance that was rushed through by the developers when they saw the inevitable defeat of their preferred commission candidates. There was a new, modified proposal presented on Thursday night, less of an overstuffed wish list and more focused on getting two proposed projects on the north side of the Causeway launched. The plan reduces the requirements of parking spaces for a hotel and for three bedroom units. The plan allows for smaller hotel rooms than our current code. The plan requires thinner buildings with greater height so it will alter the landscape. For whatever record there may be, I don't see any of these as impediments. The current requirement for 1 space per occupied hotel unit leaves too many vacant parking spaces that could have other uses and I don't think a three bedroom unit requires three parking spaces. If that's wrong, the market will quickly correct the problem. Of more concern is the height. Potentially at least one of the buildings could reach 400 feet, more or less 40 stories, and that strikes me as out of proportion to the rest of the development. I would prefer low rise buildings along the waterfront to maintain an old school, waterfront feel but the argument of economics in construction is against that, and after say 5 floors, the view impacts are nearly imperceptible to most people. Making the buildings thinner is a good solution, not a perfect one, but realistic and respectful of the landscape. It's what not in the plan that concerns me. From a commercial aspect, the lack of a requirement for shared public parking is a serious problem. 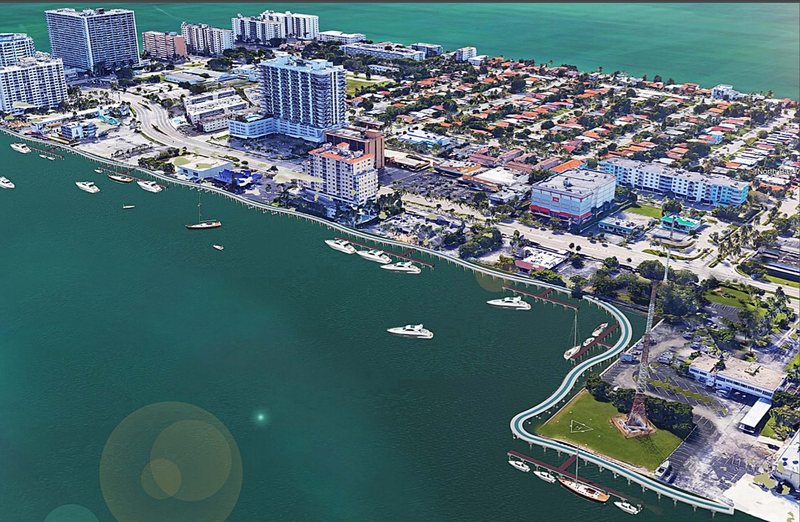 The goal of the boardwalk and the baywalk is to create a destination area in North Bay Village. That goal will be quickly undermined if the parking problem is ignored. The success of Lincoln Road, Wynwood and other destinations around Miami is based on the ability to wander. If we create a parking situation whereby all parking is privately controlled and linked to one specific commercial establishment, the area won't thrive. The Village had always conceived of the lot next to Happy's as the likely site for a public parking structure to meet the needs of the Grandview Palace and have a place for people to put their cars while they explore the new Baywalk area. In September, 2018, our commission inexplicably changed the zoning on the K-Lot to remove the court ordered restriction which required that it be used only for parking. This decision should be reviewed by competent legal counsel and seriously considered for repeal. Pedestrian access and sidewalks are only dealt with sketchily. While the proposal for the new hotel, where the Best Western is, shows a sidewalk that is separated from the causeway traffic, it was not clear if it would be free of obstacles and if the concept would continue through the rest of the causeway. Our sidewalks, except for a short stretch in front of the apartheid wall gating in North Bay Island, are a disaster. Similarly, the plan for 5 easements to access the boardwalk does not include improved pedestrian crossings. This is under FDOT but the Village can and should begin demanding that pedestrian crossings be improved. It needs to happen. The plan is slimmed down and things like the setbacks are not addressed in this new version. I guess the other thing to talk about is the change in impact fees. Right now, the fees are not due at approval and for the "resiliency" fee, it would be due in 90 days under the new ordinance. That's a good thing. It also restricts the ability to extend indefinitely, which has been the problem with the vacant lots and should give significant incentive to start construction. Of course, we are once again presented with the magic of impact fee moneys and increased tax base but we've been there before. Every new project was going to fund parks, pay for our infrastructure upgrades, and create a healthier tax roll with lower rates. None of them did and we need to be skeptical of the current claims. There is the fact that 11 buildings in North Bay Village were required to open their baywalks to the public and they have simply ignored the easements and closed them off, while the village did nothing, the reaction was "let's not re-litigate the past" but it's not the past. It's happening today and the false concern that the Village might be found without rights to the easement will bolster and embolden the new projects to cut off the Village. This happening now problem needs to be addressed now. I do understand that "behind the scenes" and without public notice, the Eloquence on Harbor Island has agreed to comply with their legal obligations, but that is just a rumor and not posted anywhere publicly. And my other concern, my suspicion is this. The only two projects presented, a rebuild of the Best Western hotel and the project behind Channel 7, did not vary significantly from their original plans yet there seems to be lot of pressure to get this done quickly and without close examination of the implications. Frankly, the lobbyist and the developers owned the commission outright for the last 8 years and never approached them about this suddenly urgent need. It was only when it became clear that the residents were on to the scam that this redo of the ordinance became urgent. Mayor Brent Latham led the workshop, with Vice Mayor Marvin Wilmoth in attendance. Latham is both enthusiastic and optimistic on getting this done right. I share his enthusiasm but not his optimism. History is our best predictor and we've been here before. I hope the commission approaches this new legislation transparently, thoughtfully and with as full a perspective as possible. I hope they understand their role in this is not just to react but to ensure that the current residents' needs are met and the whole picture, including parking and access, are part of the plan. Good article. In my opinion and from a developer standpoint. The building height is not as important as the density. Density is what will make financial sense for developers to start building. Why Not Hire Carlos Noriega To Be Police Chief?